You are purchasing a near-complete autographed team set of Vancouver Canucks from the 1997-98 Pinnacle Be A Player signature series. The team set includes direct-to-card signatures from Series 1 (red) and Series 2 (blue). 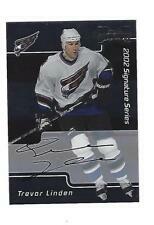 You are purchasing a:Trevor Linden BAP Signature Series Autograph Card from the 2001 - 02 season. Trevor played for the Washington Capitals. The card is numbered # 125 in the set and from BAP. The Autograph is authenticated by BAP/ITG. The complete team set includes direct-to-card signatures from Series 1 and Series 2. Each card is in near-mint to mint condition and is placed in a penny sleeve. The 10 cards in this team set include. 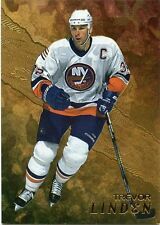 2000-01 BE A PLAYER GOLD AUTOGRAPH CARD. YOU GET THE CARD LISTED ONLY. THIS CARD IS IN NR- MINT CONDITION. If factory sealed, the item must remain sealed. It's that simple. 1999-00 Be A Player Millenium Signature Series GOLD #129 Trevor Linden autographed card. Golds are a print run of only 50! Near mint to mint condition, no corner dings or other problems. Card shown in the scan is the exact card you will receive. Item#: S41. Player: Trevor Linden. 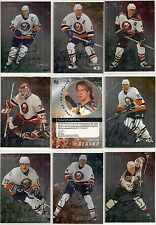 Set: 1995-96 Be A Player Autographs. Manufacturer: Upper Deck Co. I have over 2 million cards in inventory. Year: 1995. Sport: Hockey.